Three cheers for our three Crosscut Market Tote Challengers, who committed to tackle new sewing skills on a deadline. Today we get to ooh and ahh over what the challengers created with their tote-making kits and hear about their experience. Are you ready? Inside the kit they found a full-color copy of the Crosscut Market Tote pattern, rivets, magnetic snaps, leather handles and a Peltex bag bottom. Everyone seems to agree that the directions were clear and easy to follow. After cutting it only took challenger Meredith Eaten @OasisSewingCompany a couple hours to assemble, so she feels it would be a great gift. Trying something new always holds a bit of mystery. 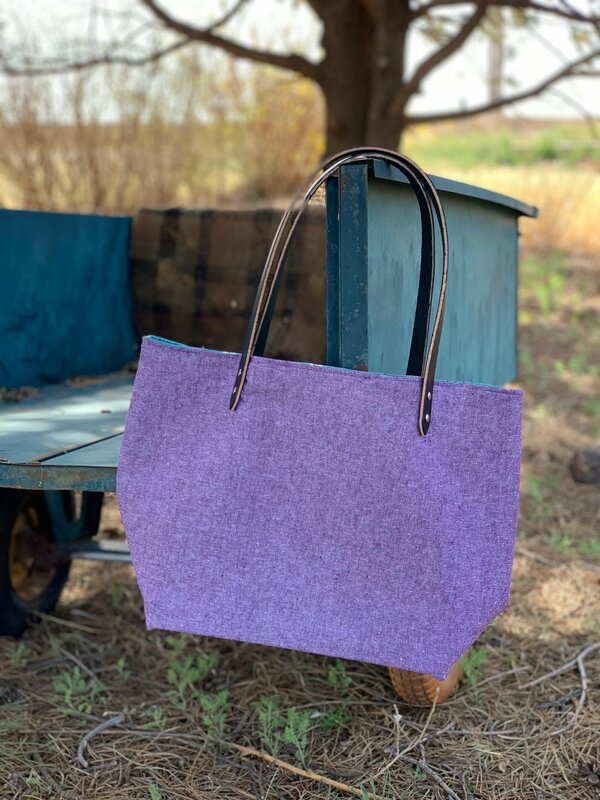 Rachel Switzer had made one tote bag before, but with the help of a friend. Using fusible fleece and magnetic snaps was new to her, but the experience was surprisingly straightforward. The Crosscut Market Tote has genuine leather handles that are attached to the bag with rivets. You can purchase a special rivet-setting tool, but lots of people just use a rubber mallet. Unfortunately, Meredith didn’t have either. I’m so glad the kit includes an extra set of rivets. I’ve learned the hard way that any project which includes set snaps or rivets can go awry. If you have an extra set on hand, you can usually try again! All three challengers seemed to have enjoyed the experience and the bags they’ve made. I agree with Meredith who said that the leather handles really “elevate” the bag. 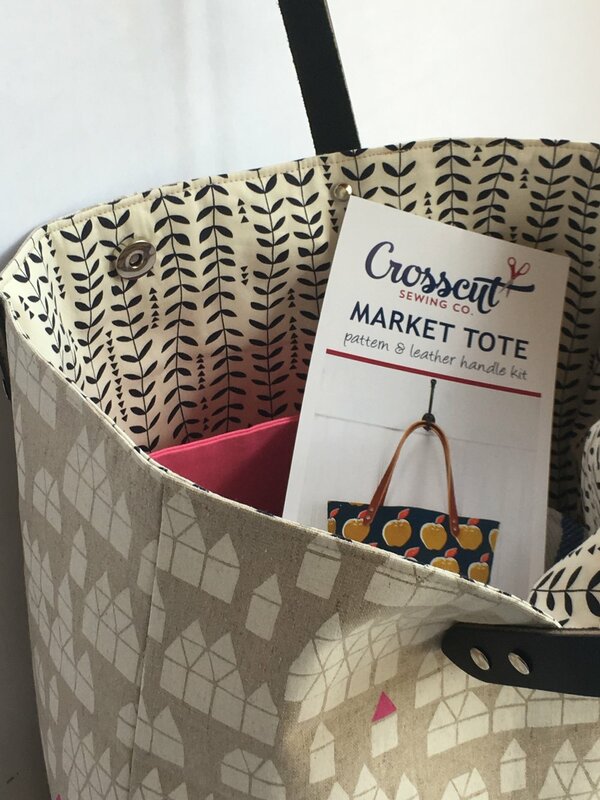 If you’d like to make your own, you can pick up a Market Tote Bag kit, which includes some supplies and the printed pattern. Or, access the free pattern online courtesy of Crosscut Sewing Co. I agree that the finished bag would be a nice gift to give, but so would the kit itself! It seems so well designed that most sewing friends would have a good time with it, even if they haven’t any experience with three dimensional sewing. As Rachel Switzer said, “It was surprisingly easy to make, and fun. I’m quite satisfied.” I can see why! Many thanks to Crosscut Sewing Co. for sponsoring this challenge and Stitched in Color. Mad About Patchwork Scrap Challenge Victories!